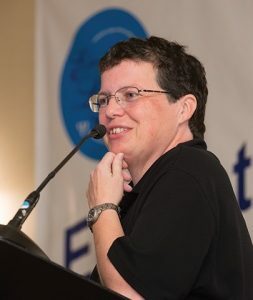 When we moved from standing in the library making Xerox copies of journal articles to downloading pdfs from a database, it seemed like an awesome development. Until we realized that marking up pdfs digitally is not easy. I would not be surprised if you told me that you print your pdfs. Here I will show you Mendeley Desktop for Windows. There are also desktop versions for Mac and Linux. 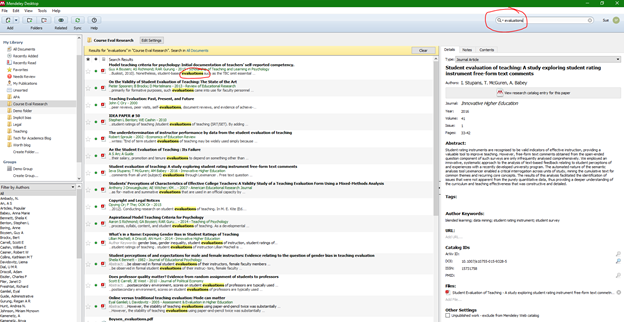 Mendeley’s web interface will keep all of your content synched across your computers. Pdfs live on your computer wherever you want them to live. Mendeley acts as an indexer. 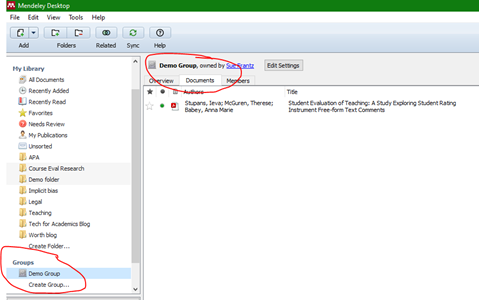 Drag and drop your pdfs from a folder to have them indexed in Mendeley. Right-click on any pdf to open its “containing folder” so you can see where that file is stored on your computer. 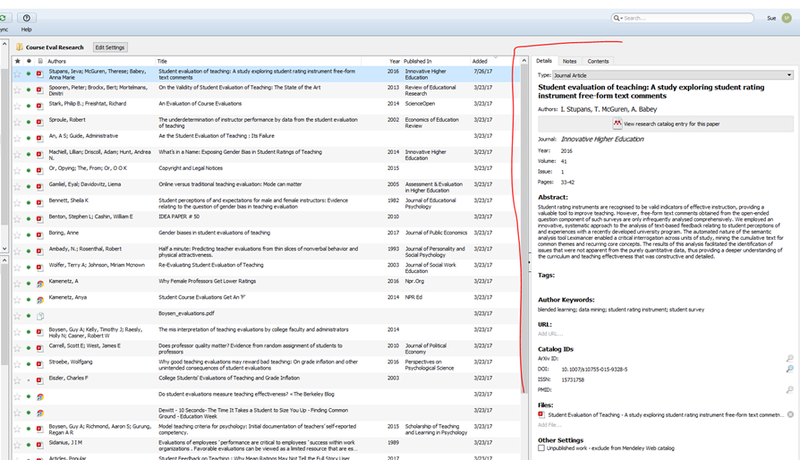 Within Mendeley, you can do some manual indexing of your own by moving your Mendeley pdfs into folders which are all on the left side of the screen. 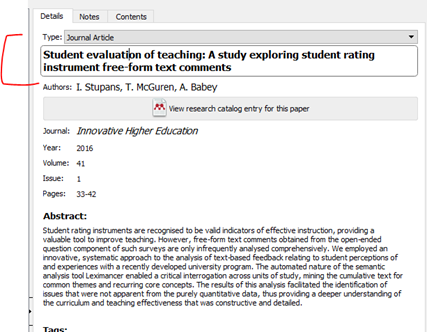 In the screenshot at the top of this post, you are looking at the contents of my “Course Eval Research” folder. 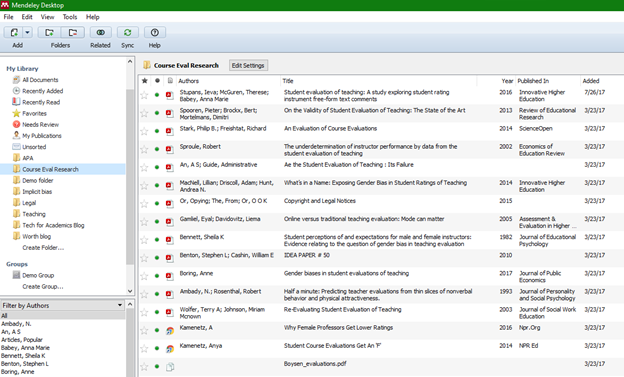 In the bottom left corner is a list of every article author in your Mendeley pdfs. Click on an author name to see all of the articles by that author. Type in a search term in the top right corner and Mendeley in real time – meaning as you type – will return all pdfs that contain your search word anywhere in the document, highlighting your search term in bright yellow. One of the challenges in working with pdfs is how to take notes on them. Double-click on any of your pdfs to open it. Use the toolbar at the top to add notes or highlight text. On the right side panel, click the notes tab to see your notes. Change the color of your note based on the type of note. For example, the notes that I want to follow up on in some way I make green. Double-click on any note to take you to that place in the pdf. Mendeley is not altering the original pdf. Mendeley is a sort of transparency that lies on top of the pdf. You’re writing on the transparency, not on the pdf. At this writing, the “general notes” at the top of the notes page searchable, but your “private annotations” are not. 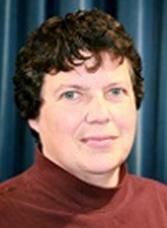 Working with collaborators or a research team? 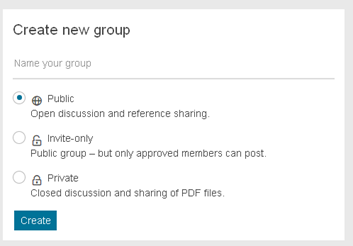 Create a group to share your pdfs. Mendeley has an add-in for MS Word that pulls in your references from the pdfs you have stored in Mendeley. Almost all pdfs you download from a library database contain metadata – data stored in the pdf file but that is generally not visible to you. Mendeley pulls out that metadata and makes it visible in discrete data fields, like author, title, publication, abstract. 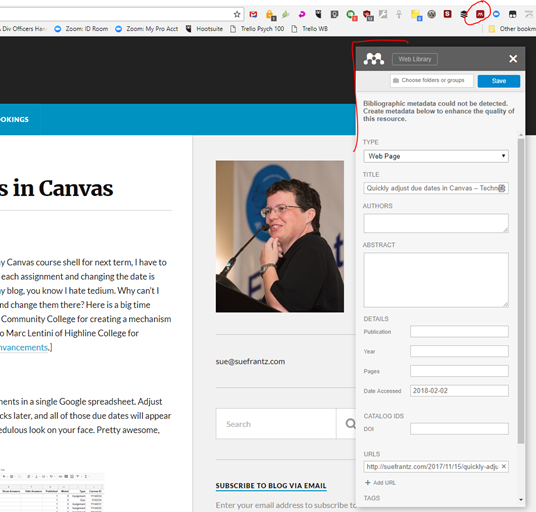 Select an article, and in the “Details” tab on the right, you will see the article’s metadata. Let’s say you’re writing something about the research from one of your pdfs. When you’re ready to include the in-text citation, from the “References” tab on the Word ribbon, click the “Insert Citation” button. In the pop-up start typing author name, title, or year, and Mendeley will give you a list of articles to choose from. Select your article and click “Ok.” If you press “Enter” instead, you can search for additional articles to include in your citation. Go to the end of your document, and click “Insert Bibliography” to, well, insert your bibliography. Any new citations you add will automatically be updated in your bibliography. Delete a citation? Click the “Refresh” button, and it will be deleted from the bibliography. This metadata is created by humans, and sometimes humans make mistakes. 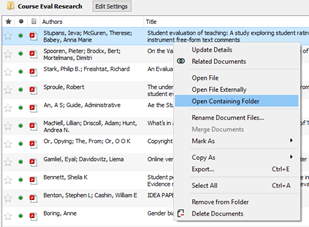 Mendeley understands that and makes it easy for you to edit the metadata. Just click on the field to select it for editing, and edit away. When you are done editing, Mendeley saves the change automatically. Go back to Word, and click “Refresh,” and your citation will be updated. If you want to save the page as a pdf, I encourage you to use CleanPrint (read my blog post) to eliminate all of the content from the page you don’t need, save the pdf, drag/drop into Mendeley, and then add the metadata. That sounds like more work than it is, and you only need to do it once. Sometimes in the Mendeley Word plug-in, the “Insert Citation” button will disappear. Save any documents you have open in Word. Close Word. When you run Word again, the button will reappear. Start using Mendeley. Like any software it can take a bit of time to get used to, but once you get the hang of it, I doubt you’ll go back. Interesting! Other than filling in the references (which I understand is no small thing), evernote does all the rest of that. Have you ever used evernote for PDFs? Also – is there an ios app for Mendeley or a mobile-optimized web version so that you can access your PDFs on the go? Mendeley has both and ios and Android app. Download them for free. I use OneNote which has similar functionality to Evernote, but I tend to keep most of my pdf notes in Mendeley. Once you see that Word integration in action, it will be hard not to use Mendeley. Of course you can keep your notes in Evernote, and just use Mendeley for the integration with Word.